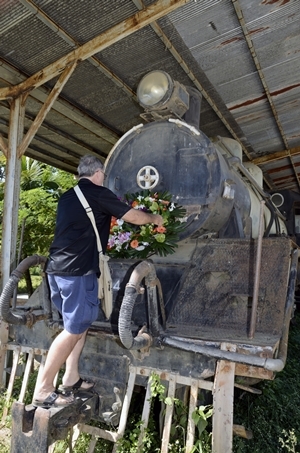 Here is Craig laying a wreath on Remembrance Day. On September 2nd you published a fascinating article about the Kawasaki locomotive rediscovered by Phil Gibbins of Rider’s Corner. That inspired me to make a video showing the Kawasaki, as well as two other retired locos in Chiang Mai. The video has been published on You Tube to coincide with Remembrance Day. On that day, myself and fellow videographer Craig revisited the Kawasaki site to place a wreath in memory of all those who died because of wars. We were pleased to see that the area is being developed in an ecofriendly way and hopefully will be open to the public in due course. Why is it so difficult to get a songthaew late night without paying a lot of money and yet there are hundreds of them driving around during the day empty. It would make more sense for them to run in shifts so that there was a better accessibility late at night for people who want to go out and drink but don’t want to drive drunk. It would seem that the police and the songthaews should work out some kind of cooperation deal so that people wouldn’t be forced to drink and drive. If they are truly serious about reducing the number of accidents and deaths due to drunk driving surely providing safe, reasonably priced public transport late at night should be one of the first solutions considered? I know that Thailand has a very high rate of deaths due to road accidents and that many of those are from people driving drunk. So, I would hope that they could work together and see more songthaews out late at night and less drunks on the road.